In this third article in the series, “What it Takes to Make Good Strategy”, I will be starting to think about the fundamental starting point for strategy – diagnosis. The word “diagnosis” has its roots in medicine and is defined by the Free Online Dictionary (which seems as good as any other) as “(a) A critical analysis of the nature of something. (b) The conclusion reached by such analysis.” The purpose of a medical diagnosis is to figure out what the symptoms mean (i.e. what is the problem) in order to prescribe a remedy that will return the patient to health. In strategy the meaning is the same, and has the same two parts. The analysis that is such a fundamental part of the strategic process is what we use to diagnose “What is going on here?” and to make an interpretation of what this means. We do this so that we can reach a conclusion about what must be done. Do we have a natural advantage that we need to leverage for all it’s worth in order to achieve or maintain our desired unassailable position? Do we need to create an advantage that can then be leveraged in order to hold the competition at bay and create a sustainable advantage for ourselves? Are we facing very real challenges or attacks which we need to overcome or defend better than anyone else in order to ensure that we outmaneuver the competition? In order to answer these questions, we need to do an analysis of the internal environment – what is going on in our own organisation – and the external environment. In the external environment, we need to get clear on what is going on with our customers, our competitors, our suppliers and in the broader environment. Too often we choose the much loved and over-used SWOT analysis as a short-cut. However, be warned – the SWOT analysis lacks rigour. We usually respond to SWOT analyses by sucking the information out of the air, by guessing, or even worse, the application of wishful thinking. In fact, Michael Porter developed his “Five Forces Model” in response to this very thing. If you are serious about making good strategy, you would be well advised to read some of Porter’s work. You cannot make good strategy if you have not done good analysis. Don’t be hoodwinked into taking shortcuts. The stock market is not a substitute for good analysis – in fact, the stock market often gets it wrong! Having been in the organisation for many years is no substitute either. In fact, tenure is probably a guarantee that you are not seeing the wood for the trees. So how could you go about doing good analysis – without incurring analysis-paralysis? Firstly, see it as an investigative process that you will carry out over time. It is probably a good idea to “ring-fence” and period of time in which to do this analysis – say three or four months – during which you will deliberately explore and attempt to develop a deep understanding of what is going on. It is also essential that you have some assistance in this process. You need to make sure that you are getting input from colleagues on your executive team. However, it is important that you insure against the effects of groupthink (the impact of like-minded people working on the problem), “social herding” (where we follow what others are doing because we think that they must be paying attention to the fundamentals), and the “inside view” (where there is a tendency to ignore what the fundamentals are saying because “our case is different”). You can really only do this by engaging the services of a skilled executive coach to guide you through the analysis process. This executive coach will not do the analysis for you, but will rather ensure that you seek answers to the right questions, as well as ensuring that you rigorously apply your minds to the data in order to arrive at the most accurate diagnosis. Don’t fool yourself into thinking that you are different! Even you, brilliant strategist that you are, need someone to help you with the thinking! What has been your formula for success until now? What has your business done better than anyone else? Anything? What couldyour business do better than anyone else? What natural advantage have you had over your competitors? Have you even had one? How have you made it difficult for others to compete with you until now? Or have you laid yourselves open to various forms of competitive attack? How have you or how are you losing your edge? What have you not yet got right? What are the weaknesses in your business model? What other weaknesses are there internally? What has changed, is changing or will change in the business/organisation? How are fixed costs changing? What trends have peaked/are peaking and how might they decline? What worries you about your business/organisation? He started on the left with the store that made the greatest contribution to profit (the first bar), then the second bar is the top store plus the second store; the third bar is the first two stores plus the third store; and so on. The point at which the hump starts to turn down (the sum of stores 1 – 16) indicates the point at which the lower performing stores are starting to impact on the performance of the business. This is not suggesting that stores 16 to 28 must all go. 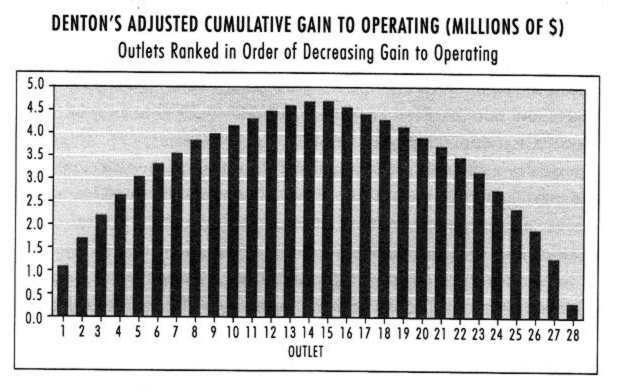 However, it does indicate that perhaps the lowest performing stores (say 24 – 28) might have to go, while some serious attention should be paid to stores 16 to 23 in order to get their profitability into a position that is not dragging the overall performance down. Now I don’t know about you, but I think this is a really cool analysis to do in any business where profit or gain comes from a variety of products, services, outlets or divisions. Of course, the analysis you do really depends on the questions you ask. It is important, during the analysis phase, to make peace with the idea that there may be questions to which the answers are, at best, tentative. You shouldn’t expect yourself to have too much certainty. In fact, if you have great certainty at this stage be afraid … be very afraid! In the course of your internal analysis, I hope you will come across, experiment with or invent some really interesting tools. If you do, please share them. If you pass them on to me, I will make sure that I share them via my website – after all, all knowledge is built on prior knowledge; and there really is nothing new under the sun. The next article in this series of articles on strategy deals with identifying and setting the strategic imperatives.